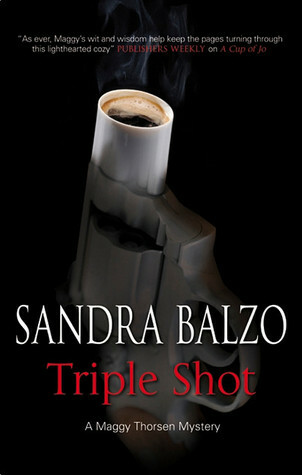 Today I have crime author Sandra Balzo here today to talk about procrastinating. Not that I know anything about that. Thanks so much for inviting me to guest blog. I’m working on my eighth Maggy Thorsen Coffeehouse Mystery, and it’s nice to come up for air occasionally. Though some might say that’s the LAST thing I need. You see, I’m the world’s worst procrastinator. My first home office was in the laundry room and our clothes were never so clean. My kids used to gather around just to watch me iron, because they’d never seen it happen before. Then I moved into the dining room and the coffee pot was set up to brew for the next day before my husband had finished pouring his last cup. The dishwasher was loaded and run daily. Even more amazingly, it was emptied. Now, as it happens, I’m sitting in my office in the mountains of western North Carolina. My desk faces the window, with a gorgeous view of a wooded glen and the mountains beyond it. I’m figuring by the time we leave next month, I’ll be able to identify every animal and plant species indigenous to the High Country. And, as luck would have it, none of that valuable information on North Carolina flora and fauna is going to do me a bit of good right now, because the Maggy series–unlike Main Street Murders–isn’t based here. Maggy’s coffeehouse, Uncommon Grounds, is in southeastern Wisconsin, where I lived until five years ago. These days, though, I split my time between the mountains and South Florida, so I decided it would be fun to take Maggy on a field trip in this newest book. Her main squeeze, Sheriff Jake Pavlik, is the featured speaker at a conference for aspiring mystery writers being held in Fort Lauderdale. Maggy tags along, figuring it’ll be the perfect opportunity for some alone-time, away from her responsibilities as a coffeehouse owner and Pavlik’s as county sheriff. But then, nothing ever goes quite as Maggy plans. On the way up to their all-expenses-paid suite, the two love birds are waylaid to participate in the opening event of the conference: an interactive murder mystery being staged on a train. OK, back to work. Wait! Is that a male cardinal?? PS: Within five minutes of my finishing this blog and going to start dinner, a neighbor spotted a black bear on our front steps. Now THAT’S what I get for leaving my desk! Sandra Balzo is an award-winning author of crime fiction, including nine books in two different mystery series from Severn House–the Wisconsin-based Maggy Thorsen Mysteries and Main Street Murders, set in the High Country of North Carolina and featuring journalist AnnaLise Griggs. Balzo’s books have garnered starred reviews from Kirkus and Booklist, while being recommended to readers of Janet Evanovich, Charlaine Harris, Harlan Coben, Joan Hess and Margaret Maron. A Wisconsin native, Sandy now splits her time between South Florida and North Carolina but continues to root for the Packers. There’s a chill in the Wisconsin air, and it’s a shot in the arm – a triple espresso shot – to Uncommon Grounds, the Brookhills coffeehouse owned by Maggy Thorsen and real estate maven Sarah Kingston. Their new autumn drink is a huge success. But two estate agents have died lately, and Sarah herself is under investigation for irregularities at her job. Then a stench begins to percolate through the coffeehouse, and soon it’s clear that corpses – like other bad things – do indeed come in threes . . . Excited to hear there is a new Maggie Thorsen book in the works. I discovered your books earlier this year and read through them all within 3 months. I’d have to disagree that you procrastinate–at least you are getting your novels written, which is more than I can say. Thanks, Debra–I’m so glad you’ve enjoyed the books. I do get them done, but have had to pull an all-nighter once or twice. Yuck, I’m WAY too old for that!! 🙂 Good luck with your own writing.